Lulu’s Cyclery is a full-service bike store. 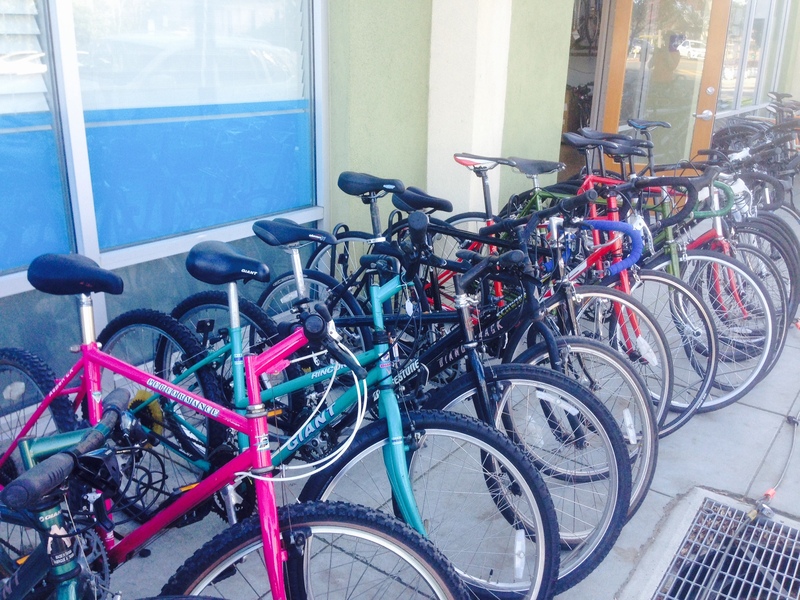 We carry a wide selection of affordable bikes to help you get around the city and beyond: used, new, hybrid, mountain, or road bike, as well as a full line of accessories. Drummer eBikes on SALE! We also offer bike repair. 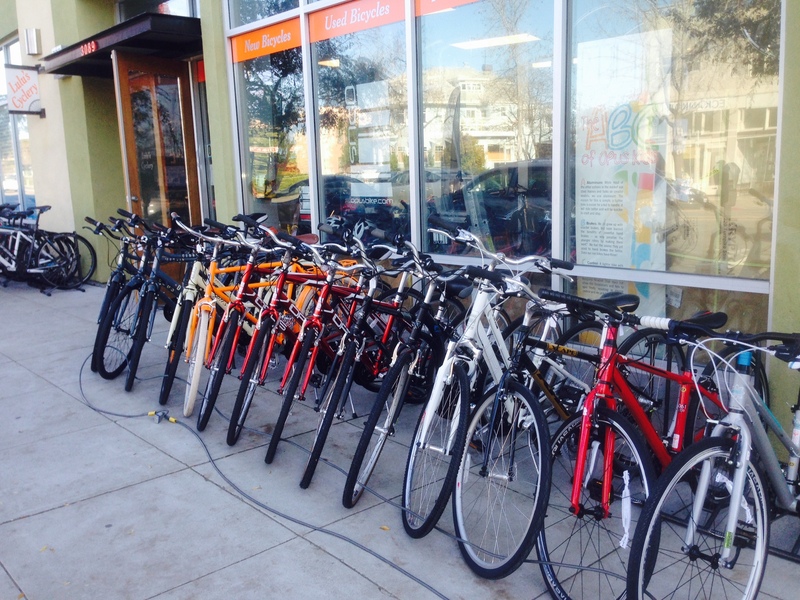 We put 13-25 used bikes on the sidewalk every weekend in a variety of sizes, styles, and prices. Our new bike lines are KHS, Brooklyn Cruiser, Evo, and Opus. Emily with Janie Dalton. Photo by Jon Suzuki. Read Emily’s occasional blog about bike racing, writing and life. The bikes we sell have been professionally assembled and adjusted and come with a service warranty. Hi! I am very interested in a road bike for my commute! my budget is 500$ – 700$ and I am 6’4 and 280 pounds. I am planning on riding this bike 14 miles on the road a day. Could you suggest some of your bikes to me? we have a nice used 64cm Giant road bike for sale for a great price… come and check it out!! Hi- how much is to rent two bikes for a week? We no longer rent bicycles. Hi. How much is a monthly bike rental? For monthly bike use, many people opt to buy a used bike (starting at $200), and then sell them back to us for around 1/3 the price in good condition at the end of the month. Bike rentals are $150/ week including helmet and lock. Do you guys rent mountain bikes? if so, how much for 1 day rental? we rent hybrids and entry-level road bikes only. Do you rent a bike with a chariot or seat for our 4 year old? We sell our kids seats for approximately $175, in addition to the bicycle, which start at $175. Hey, how much is the 1-day rental for an entry-level road bike? Also, will I be able to rent one out this Labor Day? We do not rent used bikes. Hello I’m interested in seeing what u guys have in stock but why isn’t there anything showing what u guys got in stock? I just viewed shop like Columbus Cyclery and they’re very detailed about their stocks. It’d be nice if u guys have something similar. Reason I ask is cause I’m in Sacramento and would like to see ur stock before driving there blindly. Let me know. Thanks. Unfortunately due to our high sales volume we are not able to keep current inventory listed online. Hello, do you do hourly bike rentals? I bart to work at the Ed Roberts Campus building (right above Ashby bart) and am unable to bring my bike with me to do a ride during lunch. Thanks! We no longer rent used bikes. We do not rent bikes. In the area visiting my son and looking to rent one of your entry level road bikes for a day, maybe two next weekend. Do I need to reserve or just come by? what is the cost? Do you rent electric assisted bikes? We do not rent electric bikes. Hi I’m interning at UCB during the summer so wanted to buy/rent (whichever is cheaper) to commute everyday. I’m 5’8 and weigh about 150 pounds. Since I’m leaving after the summer I would like to spend as less as I can. Do you have cheap options available? We sell our used bikes for $175 – 450 and offer a program to buy them back in good condition for ⅓ the original price, not including tax or accessories. Hi! Is there a deposit for bike rentals? If so, how much is it? Thanks in advance! We no longer rent bicycles. However, we offer a buyback program for ⅓ of the original price on our used bikes in good condition after 6 months to a year. Do you guys have a layaway option? We no longer rent bikes. I purchased a used bike from you in June but will be moving out of the Bay Area in December. Would I be able to sell you the bike back for a discounted price? yup, if the bike is in good condition we pay about ⅓ of what you paid for it.